There are a lot of base designs out there for the Builder’s Hall. Some are great, some are…well…not so great. 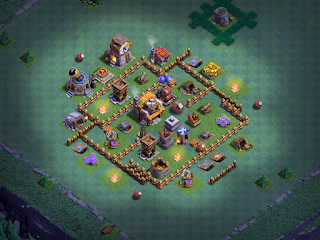 No base can defend against ALL attacks and many base designers will offer up clickbait claims like, “Anti-1-Star!” or “Best BHx Ever!! !”, which are usually pretty easy to spot. Young padawan, to the right place, you have come! Much knowledge, have I, to share! Here are some tips and tricks I’ve come up with as I design and/or modify bases. Never place a structure somewhere that it's just a giveaway (Ike the corner of the game grid); at the very least, use it as a distraction or to draw troops in a certain direction. Each troop has a weakness - SA...3 Tiles; BM loves the Crusher and the FCs, DCs rip him up; RB...Crusher; NWs...mines and MM; Beta Minions...AirBombs and Roaster. Level 6 MM can take out SA in one volley. Separate air defenses around the core; never put them on the outer edges. This one speaks for itself - bring ‘em into the middle or at least have a couple of buildings between them and the edge. Centralization and distance - AirBombs that are directly adjacent to the BH will fire on any air troops that are in range of firing on the BH. Use mines of last resort. If your base centralizes the BH, add a couple of small mines set to air along the likeliest approach. Enemy troops will often be weakened after trying to reach the BH and these may take them out. Most air attacks, including Night Witch attacks with their bats, start at the northern or southern apex of a base. That makes this the ideal place to drop a MegaMine set to air.